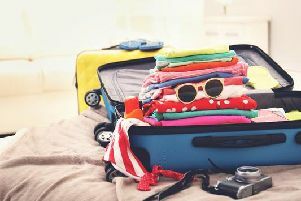 New research from holiday comparison website, TravelSupermarket has revealed families looking to hire a car this half term could be paying up to 19 times more for a vehicle purchased at the airport on arrival vs booking the same car type in advance online. Looking across the top 10 most popular destinations for a getaway this February half term, the website found holidaymakers could save an average of 72 per cent by booking ahead online. However, savings of as much as 95 per cent were available if you booked ahead online to pick up a car in Alicante, Spain, 92 per cent in Faro, Portugal and 83 per cent in Tenerife, Lanzarote and Barcelona. For example, a compact car in Alicante over the February half term week (Saturday to Saturday, February 10-17) is available at just £8.83 (or £1.11 per day) if booked in advance online, comparing prices via TravelSupermarket. However, the same car type would cost £169.82 (£21.22 per day) if purchased at the airport on arrival. A huge potential saving of £160.99. A compact car for pick up at Faro airport is available via TravelSupermarket for just £15.15 (£1.90 per day) when booked in advance. However, it is the Canary Islands of Tenerife and Lanzarote where holidaymakers could save the biggest amount, with those booking their car hire online in advance for either destination pocketing over £500 vs the airport walk up price. A compact car for pick up at Tenerife airport is available via TravelSupermarket for just £106.56 (£13.32 per day) when booked in advance. The walk-up price for the same car type, when purchased on arrival at the airport, is £626.01 (£78.25) - so there is a saving of £519.45 from booking online. In Lanzarote, you could save £518.20 by booking a compact car online for £107.81 (£13.48 per day) instead of at the airport for £626.01 (£78.25 per day). Emma Grimster from TravelSupermarket said: “There are some incredible prices available for car hire when purchased in advance for this February half term. Demand is low as other areas of Europe do not have school holidays at the same time. “With prices starting from as little as £1.11 per day, the option of hiring a car and getting that added bit of freedom and flexibility really is excellent value for money. “Whenever you are going on holiday, whether this half term or, for example, in the summer, it always makes sense to book your car hire as soon as you can to secure availability on the car type you want and to get a great online price. “Particularly for peak periods such as the summer school holidays or Christmas week, prices rarely go down online closer to the date. “As the research has shown, leaving it until you arrive results in holidaymakers spending more than they need to and being seriously out of pocket. • Book early to secure the car type you want. • Buying ahead is always cheaper than walking up. Plus, by comparing prices online in advance, you may find you can afford a larger vehicle than you originally had in mind. • Economy cars can be sometimes cheaper than mini economy. So, search all car types, not just the smallest, in order to get the best price. • And don’t forget to maximise your saving by buying car hire excess insurance in advance to save even more money. You will also get better protection than policy reductions offered when you pick your car up.